A team of chemists including Daniel Weix from the University of Rochester has developed a process for identifying new catalysts that will help synthesize drugs more efficiently and more cheaply. The trick was to do something that has not been attempted before, to examine libraries of drugs to find the cure for bad chemistry: new catalysts. The work was carried out in collaboration with Pfizer as part of a consortium of pharmaceutical companies interested in finding ways to make drugs using less expensive and less rare metal catalysts. Pharmaceutical companies are increasingly concerned about the use of precious metal catalysts because they are, after all, precious—expensive and in limited supply. "If a single mine closes somewhere in the world, a company might not be able to get the catalyst they need to make a life-saving drug," said Weix. "Using nonprecious metal catalysts, like nickel, iron, and copper, avoids this potential catastrophe." A major barrier to using nonprecious metal catalysts is that some of the strategies learned with precious metal catalysts do not seem to apply. In particular, metal catalysts typically contain an organic molecule that controls the reactivity of the metal: a ligand. "For the precious metal catalysts, we have hundreds, even thousands of ligands," notes Weix, "but many of them do not work well for nonprecious metals." This problem came into focus when Weix started receiving industrial inquiries about better conditions for his cross-electrophile coupling chemistry, which involves the interaction of two molecules with the aid of a metal catalyst. "There were a few types of molecules that just didn't couple well, yet were important to a wide variety of companies," recalls Weix. The companies had screened their ligand libraries already and found no new ligands that could improve the reactions beyond a ligand reported nearly four years ago by the Weix group. 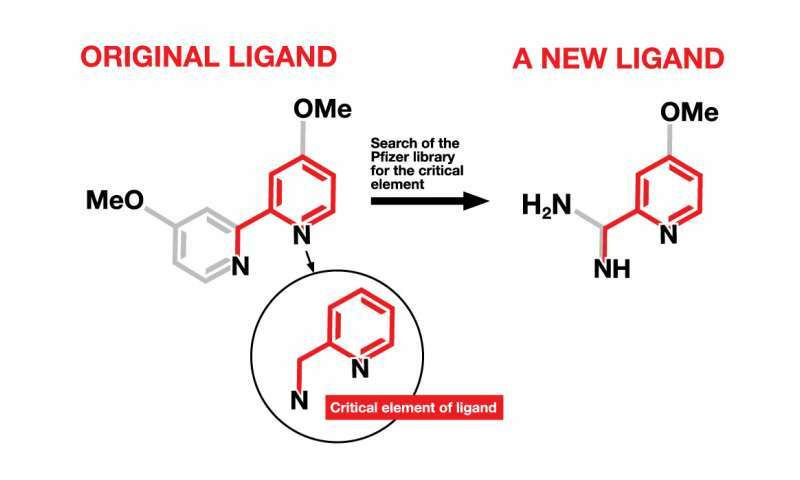 Having exhausted the commercial supply of ligands, the team at Pfizer suggested searching for new ligands among the Pfizer library of 2.8 million compounds. To help them more efficiently search such a large library, the chemists identified the minimum critical elements of the best ligands and used that as a reasonable starting point, searching the library for compounds that contained the key elements. That search returned more than 1,500 results, leading them to do a more focused search that took into account more practical concerns about availability and likelihood of being a ligand. That search gave them a more manageable 82 results. Among that group, nine ligands in three different classes were found to be highly effective. Further refinements of the "hit" molecules led to even better ligands. "While the new ligands look a lot like the old ligands, they were in a 'blind spot' for chemists," explained Weix. "These types of ligands had never been applied in catalytic reactions, and the only metal complex we found was made by accident." But since those structures are common in drugs, Weix thought it made sense that they found them in the library. Identifying new ligands is interesting already, but what ultimately matters is how well those ligands work with the catalysts in creating pharmaceutical compounds. Both of the challenging classes of reactions that motived the study were solved using the new ligands. In some cases, the improvements were dramatic - reactions that gave almost no product using the old ligands provided over 50 percent yield with the new ligands. "We've shown that it's worthwhile to navigate known libraries of pharmaceutical compounds," said Weix. "What we did was only the beginning, and it's our hope that other chemists and pharmaceutical companies will carry out similar investigations of their compound libraries." The findings have been published in the journal Nature Chemistry.